One of our most popular optional activities at Camp Jeanne d’Arc is horseback riding. Campers can choose to add this activity in addition to their standard camp activities, a unique opportunity that very few camps offer. Horse riding lessons are available three to six times per week, for novice to advanced riders. Individual horse riding lessons are also an option. When it comes to equestrian sports, a variety of riding styles exist. Our horse riding camp lessons focus primarily on English riding, also known as “classic riding.” Horse riding lessons provide a great opportunity for campers to learn the details of proper horsemanship. 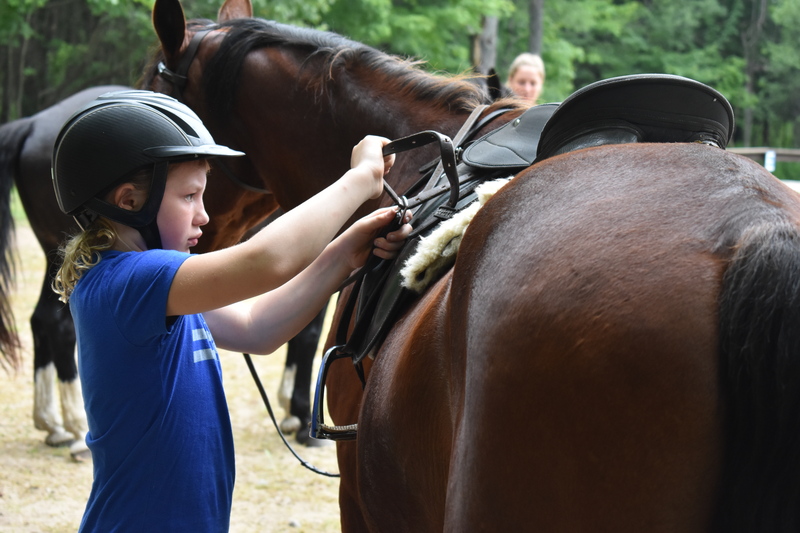 Under the watchful eye of our horse riding director and ride counselors, campers develop skills that they will use in and out of the saddle such as confidence, responsibility, patience, bravery, and self-control. Our girls love feeling the accomplishment of learning new riding skills and have such a great time together, and with the horses, of course. The cool thing about Camp Jeanne d’Arc is that by “overnight horse camps,” we don’t pretend that our camp experience is solely about horseback riding. We love that our horseback riding program is in addition to our standard camp programing. 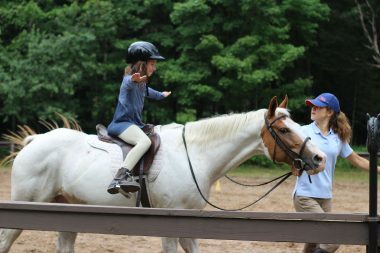 That way campers can enjoy horseback riding, and also all of the other amazing programs and activities we offer at CJDA. Something unique about our horse riding camp is that you can choose how often you would like your daughter to ride, either 3 or 6 sessions per week. If she is a beginner, and just looking to try something new, you may want to try 3 sessions per week. Sometimes trying something new—especially when it involves a large animal—can be scary. With the support of exceptional instructors and camp friends to cheer her on, camp is the perfect place to experiment with something unfamiliar. But maybe your daughter is serious about riding, and wants to spend a lot of time on a horse, you can sign-up for 6 sessions per week. We also offer an option for private lessons with our riding director. One great thing about overnight horse camps, is they can teach valuable skills that don’t have to end when camp does. Unlike some activities that are often unique to the camp experience, like archery or special camp traditions, horseback riding is a hobby that your daughter could continue throughout the year if she chooses. Maybe an introduction at a horse riding camp is just what she needs to find a new hobby that she can continue to work on when she gets back home! 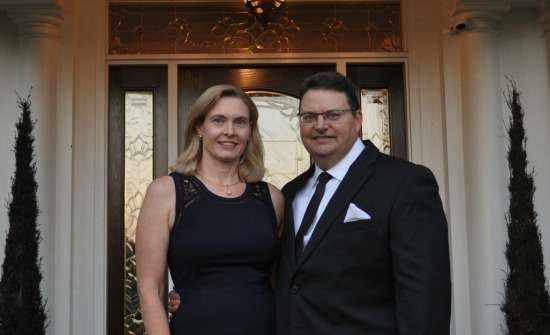 And if not… we’ll see her back on the horse next summer! Believe it or not, it is proven that there are many life lessons that can be learned from overnight horse camps. Not only can the gentle nature of horses teach us patience and persistence, but having to help care for the animals during an overnight camp experience teaches our girls responsibility and awareness. Not only will our campers be riding, they will also be involved in washing, bridling, and picking their horses hooves. It doesn’t all sound glamorous, but it allows the girls to really bond with the horses, and learn a lot along the way. 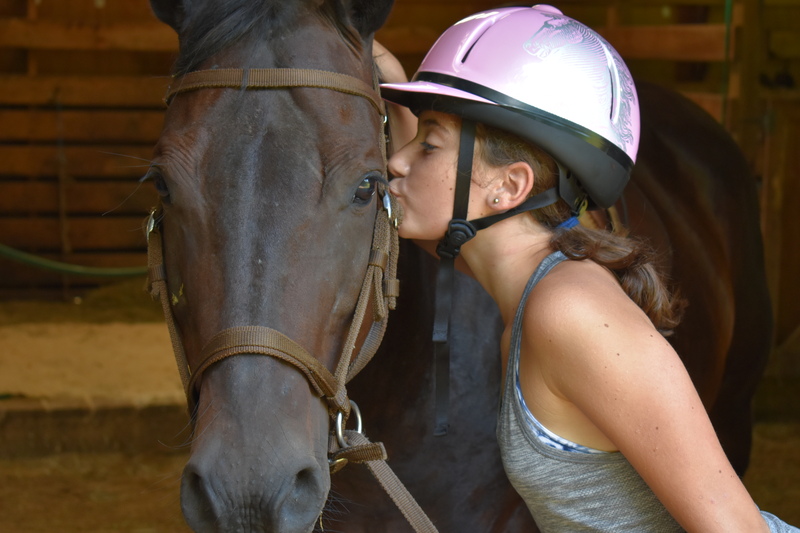 Many girls enjoy getting time away from the rest of camp to spend time at the barn, and in the riding ring with their horse. They love working on new tricks and commands with their horses, and bonding with the trainers and each other. 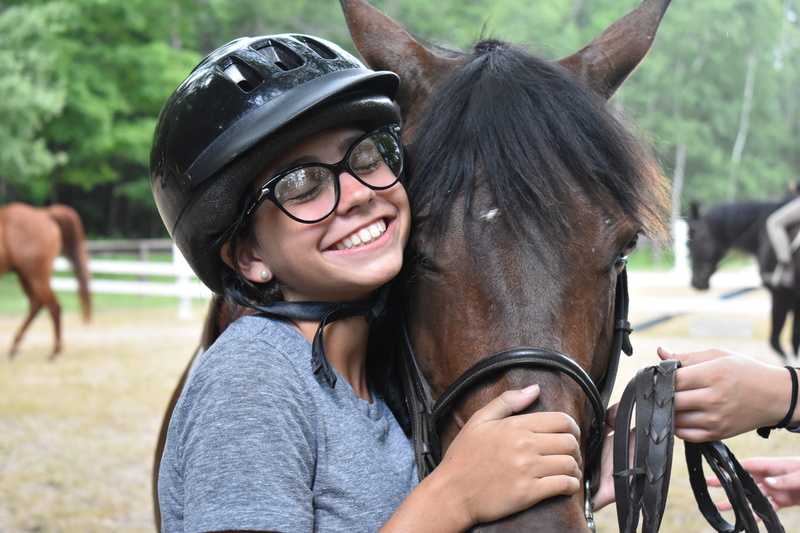 We really see the value in providing a horse riding camp experience, in addition to our standard camp programming, and we know your daughter will love her time in the riding ring. One thing is for sure, our horse riding camp is popular! Girls of all skill levels love riding horseback! It provides the opportunity to not only try something new, but to get quality instruction on a skill that they can work and grow at all year round. I can not believe spring is here again. How do I know? My daughter Izzi is counting down the days again to camp. It is a ritual every year and brings a smile to her face and ours!. We are so thankful for these camp experiences and how it has helped mold our precious daughter into a beautiful young lady. Oh, I almost forgot!. Our son Ted or otherwise known as Bear, is also wanting desperately to return to camp again. He has also grown personally with confidence and self assurance because of his camp experience the last several years. It has helped him develop in to a leader on and off the court. We thank Camp Jeanne d’Arc everyday ! !